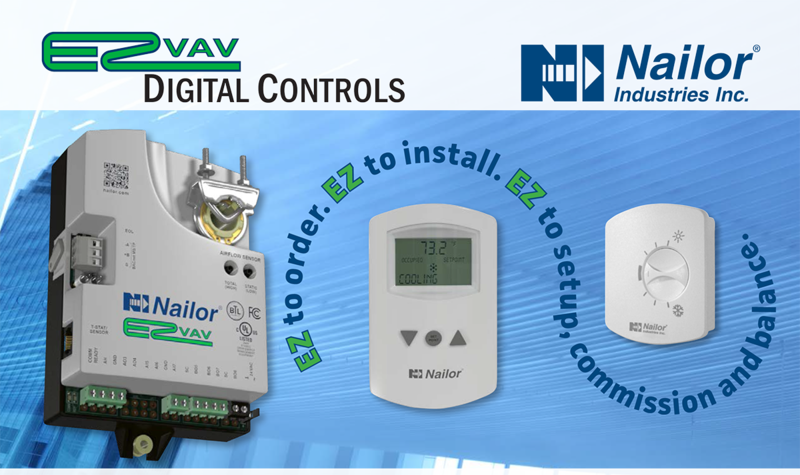 The new EZvav Digital Controls by Nailor bring simplicity to the Variable Air Volume (VAV) terminal unit market. Designed for both stand-alone applications and for integration with BACnet building automation systems, EZvav are precise P+I pressure independent VAV controllers that are pre-configured for standard control sequences that cover the vast majority of terminal unit applications. All terminal units with electric or hot water heating coils are supplied as standard with a DAT Discharge Air Temperature control sensor that can limit the discharge air temperature to a maximum of 15°F above room set point, helping compliance with ASHRAE Standard 62.1 and 55. Field commissioning and balancing can all be performed using the standard digital display room temperature sensor, which has an intuitive menu driven setup. No laptop, expansion modules, communication interface or software is required. Binary (up to 3 stages of electric heat), Modulating (0 – 10 Vdc analog) or Floating heat control. All models are BACnet Applications Specific Controllers that are ready to connect to a BACnet MS/TP network. Device instance, MAC address and baud rate are set from an STE-8001W36 without special software. Nailor Representatives’ Automated Pricing Program (RAPP) features EZ quick select options for control sequences and room temperature sensor options based on terminal unit type and application requirement. 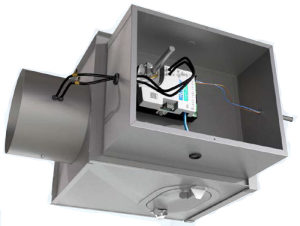 For field retrofit applications, the EZvav controller is mounted within a terminal unit controls enclosure and directly coupled to the damper shaft. The flow sensor, power supply, heat and temperature sensors are then connected. The EZvav controller automatically detects them without programming or software tools. All options can be set by using an STE-8001W36 sensor as a technician’s service tool or installed as a permanent room sensor. The EZvav Controller can be stocked by representatives to provide a simple digital solution to their customers that wish to upgrade their pneumatic or analog inventory to a new digital solution, perfect for retrofit applications! For the full product brochure please click here.